We don't do much contemporary gospel music, but this piece from Yolanda Adams is inspiring. "There is no pain, Jesus can't feel. There is no hurt, that He cannot heal." As the members of the Council listened to Stephen, they became furious and ground their teeth at him in anger. But Stephen, full of the Holy Spirit, looked up to heaven and saw God's glory and Jesus standing at the right side of God. "Look!" he said. "I see heaven opened and the Son of Man standing at the right side of God!" With a loud cry the Council members covered their ears with their hands. Then they all rushed at him at once, threw him out of the city, and stoned him. The witnesses left their cloaks in the care of a young man named Saul. They kept on stoning Stephen as he called out to the Lord, "Lord Jesus, receive my spirit!" As we reach the end of the terrible story of Stephen, the parallel to the life and crucifixion of Jesus becomes clear. In Acts 6, he was seized for heresy and dragged before the Sanhedrin. All of the long Chapter 7 recounts his defense. He has followed the Hebrews from Abraham to David, to show that their history was a preparation for the coming of a Messiah. He then accused the Sanhedrin, made up of the mightiest and highest-ranking religious authorities of Judea, of killing God, just as the wicked had killed prophets throughout their history. Even worse, he strongly implied that the Temple itself was no longer a holy place, that God did not dwell in it. And he stated that the men in charge of it, those judging him, did not have God in their hearts. Finally, he tells them that he sees Christ (whom they have recently crucified) and that He stands "at the right hand of God". At this, the high priests break. It is such a terrible accusation that they cannot even listen to it. They cover their ears and, as they did with Christ, execute him immediately. 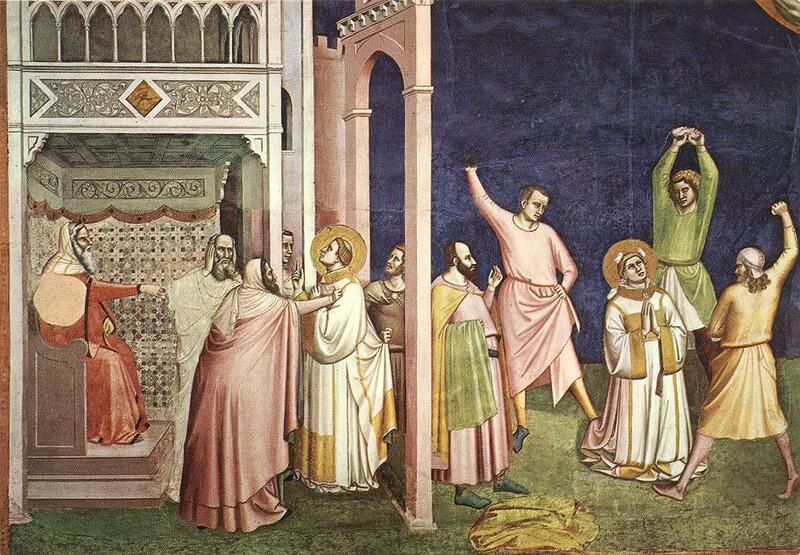 Stephen has become the first great Christian martyr. In all Christendom, he is studied as the great model of Christian virtue, a model for many to come; in the Catholic and Orthodox churches, and the more liturgical Protestant communions, he is venerated as a saint. Do not miss the reference to a young minion named Saul, who holds the high priests cloaks while they rush out to kill Stephen. We shall see a great deal more of him shortly!